1 Multitrack -- 57 Mixes! In November 2016, I presided over a Cambridge-MT Patrons Mixing Contest, based on the raw tracks of a song called 'Colour Me Red', which had been written and performed by the talented alt-Americana artist Diesel13. 57 different mixes were submitted for the competition and I wrote detailed critiques of 28 of those, which I've drawn together into an archive here (along with their related audio files) so that they're easier to navigate and compare. The critiques provide lots of material for general mix-related ear-training, but the multitrack files are also still available in my 'Mixing Secrets' Free Multitrack Download Library if you fancy trying your hand at a mix to see how your own skills stack up! Many thanks to Diesel13 for allowing us to use his song as the basis of this competition. Please support him and his music by clicking here. Thanks also to Joe Lonsdale of Joe Public Studios for making such great multitrack material available to mixing students -- for more information about how this particular song was produced, check out Joe's e-book 'Building The Band In The Bedroom'. If you have any questions about any of the critiques, do please let me know so that I can clarify. Also, if you like the mix critiques on this page, then do check out my Sound On Sound magazine The Mix Review column, where I analyse commercial chart productions in a similar way. If you need this kind of critique for your own work, then please head over to the Advice & Training page. THE BRIEF -- MIXES & CRITIQUES -- THE SHORTLIST -- THE WINNERS -- THE PATRONS PODCAST -- DOWNLOAD THE WINNER'S DAW PROJECT! Contestants had access to a ZIP archive of Diesel's raw multitrack recordings, as well as Joe Lonsdale's original mix, made in collaboration with Diesel. (These are still available for download here.) I agreed to critique all mixes submitted within the first two weeks of the competition, after which contestants were allowed to continue updating their mixes until the final submission deadline a couple of weeks later. Otherwise, the brief was wide open, and as such no commercial reference tracks were provided. Diesel said that he welcomed any slant people chose to take on his music -- even if they wanted to get radically creative with the multitrack elements or completely change the style. That said, Diesel was also interested in hearing mixes with a modern sensibility, things that might compete in one way or another with current artists in today's music market. The loudness of the mix was not a contributing factor in the competition adjudication, but the way in which the mix responded to loudness processing was taken into consideration, depending on the market expectations for the target style in each specific case. In total I critiqued 28 mixes. All of these were subsequently updated for final submission, and joined by one more late entrant. I've listed all the mixes below, along with their related sound files, critiques, and forum responses. With hindsight, what I called 'Mid-sections' should probably have been called 'Choruses', as that's fundamentally their function -- and that's the way many other forum posts refer to them. Hopefully that's not too confusing! Also, just to clarify: in order to avoid loudness bias while carrying out my mix comparisons, I used Klangfreund's excellent LUFS Meter plug-in to match all the mixes to the same -23dBLUFS reference level. The mix files on this archive page, however, are provided completely unprocessed, so please be careful with your listening levels, as there are occasionally big loudness differences between the tracks. Critique: Overall I like this mix a lot -- it's got plenty of punch and excitement and a very decent general balance between the main elements: vocals, kick, snare, bass, guitars, cymbals. Plus I like the way you've slotted in some of the 'feature' moments: the high AcousticGtr03 parts at the end of Verse 1, at the beginning of Verse 2, and in Mid-section 2; ElecGtr02's falling broken chords in the Mid-sections; the banjo in Verse 3; that eerie ElecGtr04 part in Outro 1; and the backing vocals in Outro 2. All well judged to be audible and make their statement, but never in a distracting or overwrought way. Those backing vocals are particularly interesting, because you've tackled the potential for muddiness well, and also left them a little bit indistinct in terms of intelligibility. Although instinctively I bridled at that indistinctness from the perspective of wanting to hear the lyrics more clearly, the overall impression grew on me, and added to the rootsy feel somehow, so I'm not sure I'd change it. In terms of areas that could perhaps be improved, I'd say it's the low end I'd look at first of all. One of the challenges of this multitrack as I see it is that the bass guitar itself has a lot more first harmonic than it has fundamental, and the amp it's put through actually seems to accentuate that even more. This means that if you fade up the bass so that it sounds reasonably well balanced with the guitars overall (and where it doesn't bloat out the lower midrange) you end up with very little real weight. As a result, it seems to me you've relied a little too hard on the kick-drum's low end to even out the overall mix's tonality. Clearly, these kinds of things are a judgement call, but I think the music works better with a slightly more even-handed LF contribution from those two instruments. Here's a version of your mix (5MB 192kbps MP3 ) where I've added more of the kind of low end I'm thinking of (using the raw multitrack's DI part), so you can hear what I mean -- it's like it puts the harmony and the groove more on equal terms. I've also added a touch more 15kHz 'air' to that mix too, as that's another thing I thought would help, especially in terms of balancing the extra low end I've added. You've gone for a very upfront drum sound, which I do like a lot in terms of the groove, but I also wonder whether fitting in a little more room sound on the snare in particular might help it belong better to the rest of the mix. At the moment it sounds a bit gated, and that slight sense of artificiality somehow niggles me as a listener. Maybe it's because it's neither dramatic enough to be a 'hey here's Americana with EDM drums' thing, but neither is it natural-sounding enough to fit comfortably with the style of the rest of the elements -- it's kind of like you've not made up your mind either way! To be fair, that slightly gated character is inherent in the virtual drum kit used here, but I think the preview mix mitigates it a bit more believably than yours at the moment, for instance. One more thing -- I'd probably try to tilt the vocal sound a bit away from the low mids, because it sounds a bit muffled in context. In general there's some low-mid build-up in this mix, so you need to work out where you can afford to clean some of that out, I reckon. Still, thanks for putting in a mix and starting off these critiques with the quality bar set high! Forum responses: APZX post; my reply. Critique: Lots of good balancing going on, Don -- everything comes through clearly, with lots of definition on the main riff and the vocals and particular, which appeals to me. There's a really good sense of blend too, so whatever effects you've used here are doing something that works for me. Maybe the banjo could sit a little bit more into the track? I kind of like it as a statement, but it does pull me a bit out of the environment of the rest of the band. You've also done a great job filling out the low end of the bass, which gives the low end a nice fullness, not only when the riff arrives each time, but also during the mid-sections. Mixinthecloud has already made a point in this thread that I think I'd agree with, though: my main criticism of this mix would be that it sounds just a bit overmixed -- if that makes any sense! For a start, the 3-5kHz region seems over-pushed, and that's often a spectral area that can get overpopulated if you keep adding it to different instruments to get them all to sound more energetic and upfront. I wonder whether part of this might also be you adding psychoacoustic enhancements or saturation algorithms to things (particularly the drums and cymbals) so that their upper harmonics actually become too dense, masking too many of the melodic/harmonic frequency components of other instruments. I suspect this may also be the reason that the cymbal and drum sustains sound a bit abrasive overall, which makes me want to reach for either the EQ or the volume control. It's not that I disagree with giving this music a dose more aggression, but I think I'd also rather I could turn it up, which at the moment is a bit fatiguing. As I said, I like the way you featured the banjo here, but other elements of variety in the arrangement felt a bit underplayed -- the ElecGtr02 broken chords or Rhodes parts in the Mid-sections, for instance, or ElecGtr04 in Outro 1. For that reason the long-term mix dynamics seem rather static. In music that makes such a feature of a repeated riff, I think it's worth working a bit harder to draw out and highlight whatever arrangement variety there is, from the perspective of keeping the listener engaged. Still, this is clearly a very creditable mix overall -- thanks for uploading it for us all to hear! Critique: Lovely smooth and hi-fi sound you've put together here, Olli, with very tasteful use of effects and panning giving a great sense of openness which I like a lot. The clarity is also exceptional, as several other posters have already commented, which speaks of very classy use of EQ and faders. I really like what you've done with the backing vocals in particular -- they poke out and deliver their lyrics very effectively. The long-term dynamics of your mix are also commendable -- the arrival of the Mid-sections makes a real statement, for instance, and your left-right call-and-response idea there is also very nifty. The arrival of Intro 2 is another highlight, because of the way you contrast the rather lo-fi (multed?) guitar and snare with the wide-open sound of the full band when it comes in. Very cool effects on ElecGtr04 in Outro 1 -- it takes us to a new otherworldly place just for a moment, which is all the more effective because the overall ambience feels so natural. There are only two issues I'd really query here. The first thing is that the depth perspective doesn't quite add up for me. The vocal feels a bit too distant, somehow. I'm all for giving it a bit of room sound, in keeping with the kind of vision you've developed here, but that room seems to be dragging it behind the snare and particularly the guitars. In this respect I'm not sure it helps that your dynamics settings seem to emphasis the transients of the guitars, which also brings them further forward. A particularly stark example is the banjo in verse 3, which is quite distracting by virtue of being so much more upfront. I wonder whether you might take some of the natural room sound off the lead vocal and try using a slapback delay or something that won't distance it as much? A bit of HF smoothing for the picked guitars/banjo (whether EQ or transient shaping) might also help, as well as adding a further dose of short ambience to them. The toms also suddenly leap forward in the fills -- although partly as a result of their extreme panning, admittedly. The vocal distancing dovetails into my second concern, which is simply that, from a purely aesthetic angle, I think your vision might be a bit too polite for the lyric, and indeed the vocal style. Don't get me wrong, I think your vision sounds great, but I'm not convinced it's the most supportive vision for this performance of this music. I find myself wanting a little less restraint and a bit more attitude somehow. A bit more audible pumping to the buss compression, maybe. Sacrificing a bit of clarity to get a bit more dirt and power, perhaps. And pulling the vocals further forward would fit in with that concept too, because he's one of the prime carriers of the song's combative attitude, after all. Thanks for posting -- lots of things worthy of emulation there! Forum responses: Olli H post. Critique: Interesting approach here, making more of a feature of the electric guitars and turning it in more of a pure rock direction. There's a fantastic crunch you've got on those guitars -- you've managed to give them aggression without them getting too fizzy, which is always a bit of a balancing act, so well done there. It's got a lot going for it. For a start it makes sense of the thick and slightly gated snare sound on the multitracks, as this is much more stylistically in keeping with a mainstream rock sound. The transition into the Mid-sections is also great, because of the way the cleaner panned call-and-response guitars contrast so beautifully with both the chugging stabs underpinning them and the more aggressive HMF-emphasis in the preceding riff section. Overall the balancing is pretty slick too, as I've come to expect of your mixes, and I like the lead vocal tone as well, which is both meaty enough to be taken seriously, and cutting enough to demand attention at all times (with the help of some careful automation, I imagine). In terms of what I'd try to improve, I'd say the main thing is that the bass guitar feels underpowered at the low end, and therefore the mix as a whole feels a bit lightweight. The bass recordings are in general quite light on fundamental frequency, so you'll have to do some processing to tackle this, otherwise the instrument's first and second harmonics will bloat the mix sound before you get the low end solid enough. The toms sound rather dislocated from the rest of the drum sound, and particularly the snare -- check out the fill at the end of Verse 4, for instance, where the snare has lots of ambience, but the toms sound like refugees from a Supertramp record! I'm completely in tune with the idea of blending the snare in the way you have, but if you're going to do that, then you have to give the toms some of that sauce too, I reckon. On a more general level, though, I think there are also some downsides to this more traditional rock vision. One is that it seems to lose some of the rootsy character of the raw tracks, which I think's a bit of a shame. But, that aside, relying more on the distorted elements robs your mix of a certain amount of internal movement and dynamics (electric guitars simply aren't as dynamic as acoustic guitars) and this combines with the tightly controlled drums to give the mix a slightly static and constricted feeling. If you're going to go with this vision, then I'd try to introduce a little more interaction and movement within the balance. This might be partly a case of more automation, but I think letting groups of instruments hit slightly more audible compression might also be a strategy. One other thing -- the noisy consonants on the backing vocals are really jumping out. I'm assuming it's on account of the compression scheme you're using, so it might just be a question of lengthening the compressor's release time to avoid it pulling things like that up. That said, I quite like the tone of those vocals, so if you can't change the compression without sacrificing that, then just program a bit of automation in post-compressor to rebalance the consonants. Another great new slant on this multitrack. It's really cool to hear everyone's different takes! Critique: Well, this is certainly a sound that takes no prisoners! It's almost got a bit of a punk aesthetic going on here, which is an interesting angle to hear -- especially in contrast to more conservative, hi-fi-sounding visions such as Olli H's for instance. Within this context some potential criticisms of finer points of balance or blend become less relevant, because a certain amount of imbalance is inherent to this kind of 'everything fighting with everything else' sound. The most important thing to me is that it sounds exciting, after which most other things are just window-dressing! I really like the way the Mid-sections open out in stereo, with that wide modulation on the cleaner guitars providing a great contrast to the super-aggressive and focused drums/guitar sound. I also enjoyed the way the gnarly bass tone pulled out all Joe's little melodic fills and slides -- I'd not properly noticed them all until now! Even taking your mix on its own terms, though, I think you've mid-biased it too much, which makes it a pretty tough listen at louder volumes, or on anything that further emphasises its prominent 1-2kHz region or upper-midrange distortion components. It just comes across as rather hard and brittle at the moment. I reckon you might also be able to push the loudness more cleanly than you have -- at the moment the vocal in the verses seems to be hitting a clipping stage in a way that's sending clipping 'sprinkles' dancing around the stereo picture. I'm not at all squeamish as far as clipping goes, but you tend not to be able to get away with it on periodic waveforms as well as you often can on transient peaks. Despite my general liking of the bass, it does still seem shy of fundamental (as indeed the raw recording is), and that also tends to further highlight the mid-emphasis of the mix as a whole. Some EQ or LF compression on the bass buss might help here. I also wonder whether the snare drum might be a bit overpowering compared with the lead vocal -- it seems a bit 'stuck on' as a result, makes the guitars feel a bit small, and also makes the verses a big drop-down in terms of energy and rhythmic drive compared with the riff sections that precede and follow them. Another strong vision, though, which I'm always a fan of -- thanks for posting! Critique: Well, first things first, your mix tonality feels a bit off-kilter, with a big build-up centred around 200Hz -- I felt I wanted to dial out about 3-4dB around there most of the time. I think the nature of the bass sound is partly to blame here, because (as mentioned in my other feedback posts) the bass guitar's fundamental frequency isn't very strong on these recordings. It feels to me as if you've tried to balance the bass guitar to compete with the kick-drum at the low end, but that's then over-stuffed the low midrange with the bass's first and second harmonics. Just EQ'ing the mixbuss won't do the trick, either, because (having tried that here) you lose unacceptable amounts of warmth and body from the guitars in particular. The best thing to do would be to try to get a bit more low end out of the bass guitar track itself, and then see if it'll balance more easily with the rest of the track without adding too much woolliness. The plus-side of the bass prominence is that we can really enjoy all his great little performance details and fills, but I'd look to bring those out by tweaking further up the spectrum personally. That aside, though, I really like the directness of the sound you've put together here, which totally suits the vibe of the music and performance -- a very appropriate vision to choose, for my taste. Not only is the balance very solid (especially the kick and vocal), but there's a subtle sense of movement within the balance as well, which gives it life. It's not as 'heaving' as some people's visions in terms of audible compression artefacts, and might perhaps benefit from exploring that a little further, but I already like it as it is. There's a particularly nice balance between the electric and acoustic guitars: you get the attitude of the electrics, but the liveliness of the acoustics. Nice effects on the clean Mid-section guitars too. You've not gone for such a strong alternating panning as some people have, but you've nonetheless made an impact in the stereo image with the lovely reverb/modulation halo you've added. And this leads me on to another highlight of this mix for me -- the depth perspective. The vocal blends really well, but never risks its dominant upfront position, while the drums, bass, and rhythm instruments also feel punchy and present, but never seem to eclipse the vocal, which takes some doing. But the cherry on the top is when things like those Mid-section guitars (and indeed the ElecGtr04 and backing vocals in the Outro) suddenly open up different, more distant perspectives that not only serve to make the whole mix more varied, but also cement the psychological impression that the main band is right up your nose! But it's not just the dry/wet issue that's making the depth picture work so well: I think it's also the EQ and transient-processing choices, which all seem to support the front-back position suggested by the effects. That said, I think the snare could afford to have a bit more level and snap without it taking attention from the vocal. At the moment, the kick drum seems almost like it's a bit more present than the snare. The more I listen to this mix, though, the more I like it. Great work! Critique: This mix has a nice homogeneous quality to it -- it seems to glue together nicely. Presumably this is because of careful use of effects and compression, the latter also providing some nice pumping effects in the mix which help bring it alive. I think the transients of the acoustic guitars could perhaps be smoothed off a little to prevent them sitting so far forward of the rest of the band, but otherwise I like the illusion being generated here. In any mix where there's a bass guitar with electric/acoustic guitars over it, there's one particular question that's critical: how much low midrange should the guitars have, relative to the bass guitar. In Americana it's particularly tricky to gauge this, because if you give the guitars too much low end you end up sounding too much like heavy rock, whereas if you give the bass guitar too much low midrange it begins to sound a bit too much like pop country -- and it's the latter direction that this mix seems to be tending towards a bit too much for me. The plus side is that you get lots of sweet-sounding warmth and plenty of focus on the melodic interest of the bass part itself, but what you lose is a sense of power and authority from the guitars. Someone on another thread commented that the guitars are the soul of the groove here, and I can see their point. By curtailing their body as much as this they don't seem to propel the music nearly as effectively, as well as generally giving the mix tonality a strangely 'hollow' feel, despite no lack of sheer low end from the bass guitar. Of course, the nature of the bass guitar itself doesn't help here, as it has a good deal more low midrange than you can probably make use of. Try favouring its fundamental more, and you should then be able to rely less on the midrange for subjective power. I wonder whether the guitar thinning is also the reason why the arrival of the Mid-sections doesn't make the psychological impact I'd hope, but it might just be that you've been too coy with the ElecGtr02 and ElecGtr03 parts -- they're a vital part of the arrangement dynamics, so I'd let them shine more than you have, whether you do that with simple level and panning, or by odd effects (as some people have). Lots of good solid decisions here, though, and there's a good logic internally. Thanks for letting us hear it! Critique: Before saying anything technical about this mix, I'd just like to say that it has something about it that I associate with all my favourite mixes: namely, that even though I'm already familiar with the multitracks and various other mixes of them, there were numerous moments in this mix where I felt that I was rediscovering elements afresh. The backing vocals stunt is the most obvious thing -- an inspired choice to give us the chance to hear them on their own, because fundamentally they deserve it in terms of pure character. Another thing that really opened my ears was the banjo during Outro 2 -- beautifully judged to come through clearly for a last-minute injection of interest, and fitting as if the mix had been just waiting for it to come along, even though it didn't seem as if anything was missing from the texture until then. Sonically, though, this mix is also pretty impressive. Great sense of frequency bandwidth, with plenty of well-controlled low end to the bass guitar (one of the challenges on this multitrack), and an impressive sense of stereo width by virtue of the LCR panning. Perhaps counterintuitively, I think that the comparatively narrow drum image actually makes the overall mix panorama seem wider, given that it seems to put more horizontal distance between the drums/bass axis and outlying guitars. It also, incidentally, provides a nice little stereo pocket at mid-left and mid-right for those backing vocals to slide into. Not that I'm implying that this is an overly 'technical' mix, because it still gives an enviable sense of excitement and rawness -- reminds me of some of Randy Staub's mixes, in fact, in that respect. It's a living, breathing thing, and gives a powerful psychological impression (by virtue of what I'm assuming is no scarcity of compression!) of straining fiercely at some kind of leash. Not a bad impression to give for a song like this, I reckon! My only real criticism is that perhaps some of the compression is a touch too fast, particularly on the drums, as the mix as a whole seems to lack some midrange punch. I'd prefer to leave a few more peaks in there to add more of a real 'slam' to the attitude and excitement that's already on offer. That said, as it stands, this mix does, by virtue of its well-controlled bass and 'less voltage, more illusion' drum sound, respond ridiculously well to loudness processing, if that happens to be appropriate -- go on, try it for yourself, it's surprising how far you can go without unacceptable processing side-effects. And if I'm really picking nits: is the vocal a bit too recessed in the Mid-sections? I reckon it might work better to give it a bit of a new effect, something with a tail, to support the more open sound of that section as well as allowing you to pull the vocal a bit up in level without ungluing it. Just a thought. That aside, though, I would agree with the other poster who complimented you on the vocal sound in general -- very commercial and contemporary sounding. We could all learn something if you wanted to go into more detail about your specific settings there, I imagine! Anyway, as you can probably tell, I like this mix quite a bit. Thanks Dangerous for the masterclass! It might not be everyone's cup of tea in terms of vision, but on its own terms it's pretty hard to fault. Critique: Another nice alternative perspective here, focusing more on rich-sounding guitars and deep LF power from the kick. Actually, I wondered whether you might be a guitarist yourself, because you've brought out such a lot of nice tones from those instruments here. For the most part I like your balance decisions too (especially during the main riff), although I do wonder whether the clean guitars in the Mid-section are too loud and full-sounding in context -- I kind of lose focus on the vocal as a listener, and it also slightly undermines the illusion of power and rhythmic energy in the rest of the band. Another couple of things that also feel a bit far forward for me are the banjo transients in Verse 3/4 and the overall level of the backing vocals -- again both tend to make the rest of the backing parts sound subjectively less impressive by contrast, for me. Your arrangement changes are bold (which is always an endearing quality in my eyes! ), and the way you shorten the intro to get to the lyrics more quickly is often a canny move on a commercial level. I also like the way the band entry isn't exactly in tempo with the opening SFX section -- it leaves that moment of feeling like I'm 'holding my breath' just before the band arrives. My only concern about the intro is that it's such a statement sonically that the actual band entry ends up sounding almost a bit of a let-down! If that's also a concern for you, then maybe you could try limiting the bandwidth and/or the stereo picture of the initial modulation effect? The Outro is also a cool innovation, although from a musical perspective I did ask myself whether it might not be overkill to repeat the riff section further, given how often it appears in the rest of the song anyway. I agree it's a cool riff, though, and I could certainly listen to it all day myself -- but I am a mix engineer, so I'm not sure how well I represent the regular punter in that respect! Thanks for presenting another thought-provoking vision -- it's a mind-expanding business this mix critiquing! Forum responses: Mixinthecloud post; my reply. Critique: Wow -- super-forward-sounding rhythm section, this! I like the wiry bass quality you've brought out in particular, as it really seems to drive the track rhythmically. The voice also has an assertive quality that fits well with the rhythm-sound you've chosen. I do have some reservations about the overall tonality, though, which seems rather hollow, as if you've over-scooped the low mids on too many tracks. (Perhaps in response to the previous poster's comments?) The low end also seems rather light, and I reckon you could bring more of those low frequencies out of the bass guitar to even out and extend the frequency bandwidth as a whole. Although the snare is clearly designed to drive this track, I think you've maybe overbrightened it, as it pushes too far in front of the vocal for me, and quickly gets a bit fatiguing too -- I found myself turning your mix down as a result, which probably isn't a good thing! The toms feel too forward as well when they play, although this is as much a pure level issue as it is to do with their also quite forward HF character. The guitars are balanced quite low in the mix overall in your version, which in principle I have nothing against, but in the case of this particular track the guitars are responsible for most of the arrangement variation, so it reduces the sense of 'light and shade' musically doing that, in my opinion, so I'd maybe reconsider that a little. One other area you might want to work further on is effects, in particular the kinds of general-purpose delay and reverb effects that help blend things together so they sound like a real ensemble. The toms are a case in point here, because they sound like samples rather than part of the kit, and the snare also suffers from this to a lesser extent. The vocal sounds rather too much like an overdub for me too, despite the rather nice characterful effect tail you've chosen, and in general I think you could get a more cohesive and full-sounding result if you investigated more what tempo-delays and reverbs can do here. I'd certainly use some kind of a short ambience reverb to help tie the overdubs together and blend the drum close mics with the overheads, for instance. Thanks for posting, though -- my head's definitely nodding to the beat on this one! I like that there's plenty of movement in the compression, especially on the drums (love the fill at 2:11! ), which helps add to the general excitement for me. I do wonder whether you've lost a bit too much mid-range punch in the process though -- all the snare and kick attack elements sound quite slender, somehow, rather than meaty. Yes, there's low end on the kick, but it's rather soft-sounding and sub-heavy, and doesn't seem to really punctuate that nice round-sounding bass guitar you've created. Speaking of which, although I do like the warmth of the bass in general, I think the guitars seem rather thin by comparison, so I'd be tempted to scoop a bit of LMF out of the bass and give it back to the guitars. The distorted vocal sound is another great addition, which again keeps this mix quite rootsy, despite the more electric sound you've gone for. I also like your vocal balancing -- it's not too loud, but it does maintain its position in the balance very solidly nonetheless and demands the attention it deserves. On the other hand, the clean acoustic-guitar transients in the verses seem to sit over it, which is maybe not ideal -- I'd either take some transient off, or balance them lower... or maybe even distort them too! Thanks for posting -- you've suggested a lot of interesting new approaches to this multitrack, which is one of the things I really love about being able to hear so many different mixes of this song! Critique: I like the loose, rattling snare sound, as well as the well-blended drums, which help make that slightly gated-sounding snare recording fit into the kit really nicely. There's something very rootsy about this roomier presentation, which suits the overall vibe of the music, and it also helps keep the drums from being unduly far forward in the front-back perspective. Some of the acoustic guitar and banjo strums in the verses do seem to come a bit far out front for me, though, and I also wonder whether the lead vocal could afford to be a touch further forward. Interesting vocal sound you've chosen here, with quite a chorusey, comb/filtered quality -- partly a side-effect of that split-channel micro-delay effect you used, I imagine. In abstract terms it doesn't make the vocal sound very hi-fi, but as an aesthetic choice it works quite well, again by giving a sense of something captured live in some kind of appropriately backroom acoustic. I also like the backing vocals' processing, which gives them a nice growl and places them far enough forward to make a statement without undermining the size illusion of the rest of the band unduly -- although I'd still do some extra work to de-emphasise the 'ch' and 'f' consonants in particular, which do leap out a bit too much for me. Overall the tonality seems light on the bass, as with quite a few of the mixes I've critiqued, presumably on account of the bass guitar's fairly weak fundamentals, although on the plus side it doesn't feel like you've overcompensated by over-egging the kick drum's low end, which is clearly a temptation here. As before, I'd recommend trying to enhance the bass's low end a bit to fill out the lower octaves of the spectrum. I like a lot of what you've done with the guitars tonally, especially the way the banjo fits into the Outro 2 section. The clean guitars in the Mid-sections, however, sound a little too pristine somehow for this mix overall, so don't seem to sit comfortably with your vision. I'm OK with the idea of them being a new idea and/or in a new space, but at the moment they just feel a bit 'stuck on'. Perhaps they just need a little bit less dynamics and a touch of 'fur' from some kind of analogue harmonics processor. It may also be that the low mids feel a little too large for their role in the arrangement, and just slimming those might help sit those parts better. Still, this is a great vision which fits round the vocal and lyric really appropriately. Thanks for posting! Critique: Well, you're certainly not afraid to wield the editing scalpel! I can see where you're coming from here, in that the riff is such a strong element of the arrangement that it feels a shame on some level to interrupt its relentless groove in Outro 1. Even in that context, though, I think I'd still have left Mid-section 2 in there, as that provides crucial musical variety -- you could still have cut straight from that to Outro 2 without dropping the beat. I like that you kept the ElecGtr04 part from Outro 1 in there, though, as it'd have been a shame to lose that! The blend of acoustic and electric guitars in the main riff section is also pretty cool, making a nice balance between lively dynamics and rock attitude. When it gets to the Mid-section, though, the cleaner guitar layers seem rather understated, which feels like a bit of a wasted opportunity in terms of differentiating the song sections. Could the bass maybe have a bit more bite in the midrange too overall, so we hear its nice little fills and slides better? The overall tonality does seem rather clouded and middly on the whole, partly because the sub-100Hz region feels underplayed to me, and partly because the lead vocal's pretty much the only part that's contributing much above 5kHz -- there's a bit of energy from the acoustic guitar strums and snare transient, but there's not much besides. I can see the argument for clearing away some high end to reduce vocal masking, but I think that needs to be weighed against the danger that the mix will then sound a bit woolly whenever the singer's absent, which it quite often is here. In some cases, overall-tonality issues are quite simple to remedy with a bit of buss EQ -- it's rare that I do a mix without buss EQ myself, in fact, because I usually end up giving my first-draft mix a bit too much of some frequency range or other, and then my ears get used to it so they don't notice... at least, until I get slapped round the face with it at the referencing stage! However, in this case I think you'd need to rework the lead vocal sound, because if you simply boosted the highs on your mix buss as things stand, the vocal would become very harsh -- even without buss EQ, in fact, the vocal's already on the bright side, and discourages me from turning the listening volume up, which probably isn't good for a song like this. I do like the vocal delay effect, which gives a feeling of room boundaries without overtly distancing the singer, although I'd perhaps low-pass filter the return, as the consonant 'ricochets' get a touch distracting in the verses. Hope some of that's useful. Thanks for posting! Critique: Lots of very intelligent arrangement ideas here. The biggest innovation is the drop-down at Verse 3, which makes a lot of sense. The problem with riff-based structures is that they often try to pull off one big build-up lasting throughout the whole song, which is extraordinarily difficult to deal with from a mixing perspective: either the earlier sections sound over-sparse; or the later sections become over-cluttered and run out of headroom; or somewhere between those two points the momentum just flags, because there's so little you can afford to add to each new section without making the following section feel like a let-down. This is something you can hear people like Mumford & Sons grappling with repeatedly, for instance. If you can stick a drop-down in the middle of the song, however, the long-term dynamics of the mix get much easier to manage -- you only have to sustain the momentum of your build-ups across half the time. Now in this song, there's already a drop-down of sorts at Outro 1, but that still leaves a lot of the song as a single long build-up, so in that respect I think your move to add another drop-down at the start of Verse 3 is a canny one in terms of maintaining the music's sense of excitement and forward drive. I also like the way you've generated a sense of build-up across your 'multi-ramp' structure by differentiating repeating sections, for example: Mid-section 1 versus Mid-section 2; the Intro riff texture versus the riff texture following Verse 1; and Verse 1/3 versus Verse 2/4. So, overall, your thought-process appeals to me a great deal. However, I think a few of the specific arrangement decisions don't necessarily work out that well for you in practice. For instance, the decision to remove the heavy electric guitar chugs from Mid-section 1 leaves that section sounding a bit lacking in energy after the riff-section that preceded it. The electric guitars already play a more stripped-back, subsidiary role by nature of the part, so I'm not sure you needed to remove them there in terms of clearing space for the new cleaner parts. Of course, though, keeping them in means your Mid-section 2 isn't then substantially bigger-sounding than Mid-section 1... Ah, the joys of juggling long-term dynamics! One way of squaring the circle here might be simply to mult that Rhodes part for Mid-section 1 so you can give it more of a middly, upfront sound which is closer to the function of those missing electric guitars. It'd need to be finely judged, but then dealing with these kinds of issues tends to be a bit finicky -- it's one of the hardest parts of mixing, I think. Overall, though, thanks for throwing a load of great arrangement ideas into the pot here -- it sounds to me as if you're thinking like a musician, which is never a bad thing! Critique: This mix presents an extremely cohesive vision -- the sense of blend is excellent, and you've achieved it without sacrificing too much attitude or the generally fairly upfront sound. I love the fact that almost everything sounds like it's 'of a piece' aesthetically, and that you've not spared the compression, but at the same time you've maintained enough internal dynamics to keep things exciting. In general, I think your overall tonality would have benefited from more low end on the bass guitar (in common with many of the other mixes I've critiqued) but otherwise I like the slightly middly guitars tone, because of the bluesy quality it emphasises. That said, the difficulty this creates for you is that it masks the lead vocal strongly in that region, so you've had to rely heavily on the singer's high end for audibility, leaving the vocal tone feeling a touch wispy and lacking solidity. I think I'd try to give the vocal a bit more midrange so that it feels more solid, and then duck the guitars as necessary when he's singing to avoid too much of a midrange build-up. I suspect it might also help to dip a bit of midrange out of the drums, which don't need to be quite as upfront in that range, I reckon. Overall, though, I like your balancing in general. Perhaps the Mid-section clean guitars could have a little less low midrange, as they make the rest of the mix begin to sound a bit 'terrier in a tin' there -- it's not a huge thing, but worth doing I think. Great idea with the distortion on the Outro 1 vocal! The backing vocals are pretty cool too: just on the verge of being too loud, but perhaps it's just the consonants that are over-prominent to me. Maybe just de-ess them a bit more? All things considered, I like this version a lot. A no-nonsense, powerful groove with a coherent and convincing identity. Great work! Critique: Lovely meaty kick-drum sound, but it does seem to overpower the rest of the mix a bit. For me this isn't just a balance issue, though, because the kick takes the back-beat during the verses and seems to slightly imbalance the groove there as a result. To be fair, the snare is also nice and strong, although the toms feel then very underpowered by comparison, and the kit as a whole also sounds more hip-hop than it does roots/rock. Were the rest of the production also in line with a more programmed perspective, I reckon you'd get away with it, but as it is the comparatively conventional guitar and vocal sounds make it less convincing as a vision for me. The bass guitar has a nice muscly sound -- not too wiry, but with plenty of note definition so that we can really appreciate the details of Joe's performance. As with many mixes on this sub-forum, the low end of the bass feels a bit underplayed, but if you were going to add much low end to it you might have to rein in the low end of the kick to avoid your overall LF levels getting out of control. The guitar sounds are appealing in a general sense, and the acoustic guitar/banjo pick noise is well handled to avoid those instruments poking out of the balance too much. Overall, though, the combination of bass and guitars is giving you too much low midrange, I think, so some careful dips in that region across those parts (or even across a buss of them all) might bring some benefits there. I'd personally bring the lead vocals up a good decibel or so, and also add something to make them sound a little less starkly separated. I like the idea of upfront vocals, but I think you could still add some width and/or a hint of some kind of acoustic without distancing them unduly, and that way they'd seem to belong better with the guitars/drums, I reckon. Just something like a hint of stereo slapback would do the trick, I'd have thought. Thanks for delivering another distinct vision -- there's some serious punch and attitude here! Critique: You've got a nice cohesion on the drums here, plus I like the way they fit together with the electric guitars in particular. Certainly, the groove skips along very nicely, which is a good sign in terms of the balance of the rhythm section, and I like the gutsy attitude of the mix as a whole. Careful with the low end of the toms, though, which seems to boom out on that big fill at the end of Verse 4. As with a lot of the mixes for this multitrack, I reckon you might get a fuller low-end sound by adding more fundamental to the bass guitar, and I'd probably also cut a bit of 150-200Hz on the kick, bass, and/or electric guitars, where you're getting a frequency build-up that's making things seem a bit muddy. The other culprit in terms of subjective muddiness, though, is the lead vocal, which seems very veiled tonally, especially by contrast with things like the cymbals, acoustic guitars, and banjo. A 2-3dB of EQ cut around 250Hz on the lead vocal would probably help straight away, I reckon, allowing you to pull the track up further in the balance for a more upfront overall presentation. I also wonder whether some slightly wider stereo effects might help glue it in with the wide drums/guitars better, as well as giving it a bit more of a sense of 'air'. A bit of a boost to the mix overall in the top octave of the spectrum might also open it up in general (I'd try at least 3-4dB up above 10kHz), although you might want to rein in the acoustic guitar transients a little in that case, to avoid them sounding too plasticky. I wonder whether you could make more of the clean guitar parts that arrive in the Mid-sections. At the moment they seem a little bit apologetic, where I think they could be a much more active source of arrangement variation and section definition. There also seems to be something slightly dissonant going on in this section too, and I wonder whether it's related to some processing on those parts or on the Rhodes. Listen at 2:16, under "...taste, and everything's the..." -- it's like there's an E natural pitched resonance being added to that Cm chord somewhere, which feels odd. I've quickly bounced this out for illustration (5MB 192kbps MP3 ), and I've also bounced out a version with a 656Hz EQ notch that removes it (5MB 192kbps MP3 ), just to illustrate what I'm hearing. Hope some of that's helpful, and thanks for posting! Critique: Nice to hear a more acoustic-led version of this track, having just critiqued several that take a more electric slant, and it's a very convincing version in general from the perspective of the band. Some people have taken a very compressed sound for the drums, but here the compression feels much more moderate and in keeping with the more acoustic outlook. Things also seem to blend quite well, too, although the effects have been carefully applied to be pretty stealthy, which is rarely a bad thing and certainly seems to keep things fairly direct-sounding in this case. I'd maybe pull back the higher frequencies of the acoustic guitar's picking transients, because they do come a little too far out from the texture, relatively speaking, and the low midrange of the backing vocals feels like it's building up in the mix a bit too much, so some subtractive EQ might be worthwhile there. Otherwise I like the way the sounds fit together for the most part, with the exception of the bass guitar, which seems to major on the frequencies that prove most troublesome from a mix perspective, namely the low midrange. I'd suggest giving it a bit more fundamental (the raw tracks are a bit shy in that respect) and then maybe some more true midrange to bring out the melodic interest, which is maybe a bit too understated at the moment. I can see there's already been some discussion on this thread about the vocal distortion. If I can pay in my tuppence-worth, I think it actually works really nicely in terms of making the vocal seem more exciting. The patch suits the voice in this case, and hearing it made me think 'wow, that really is a great vocal performance' despite my having heard it more often than Diesel himself has by this point... What I'm trying to say is that the processing seems to be enhancing what I already like about the vocal, which I think is great. On a technical level I think you might want to automate an EQ on the distortion return, though, because it does make the vocal tone feel overly congested at times, particularly in the Mid-sections. In Mid-section 1, for instance, it seems a bit muddy on "here", "taste", "away", "see the writing on", and "me fall", to be specific. However, despite all the things I like about the vocal distortion, it does cause a bit of a problem getting the vocal to sit with the backing track, because it feels a bit like it belongs to a different (probably more electric/rock) vision of the mix. So, in that respect I think something in the backing needs to bridge this divide before the vocal will sit properly. I actually wonder whether you might just be able to sort it out simply by setting up a stereo distortion+compression send, feeding it from the acoustic guitars and snare, and then mixing that in a little bit. It's not that I don't like the acoustic vision, it's just that it seems a bit clean to work with that kind of furry vocal character. Altogether, though, I like your approach a lot, and it's really highlighted what a dose of vocal distortion can offer for this multitrack. Thanks for posting! Critique: Glad to see you're not hanging around getting to the vocal! It is, after all, the star turn here, so I can certainly see where you're coming from by shortening the intro. Not sure the slightly glitchy intro effects really suit the style of the rest of the track, though -- it's just a bit too EDM! The tambourine is an interesting addition, especially the way it changes the feeling of the verses by accompanying the kick drum. I think I rather like how that works, in fact -- a nice touch! Overall, the first thing that hit me, though, was that the overall mix tonality felt a bit muffled, with a couple of decibels too much energy in the 150-250Hz region and too little above about 5kHz. Nothing a bit of master-buss EQ can't handle, but that said, you have a similar lack of bass-guitar low end as many of the other mixes I've critiqued, and I reckon your mix would benefit from a bit more of that instrument's fundamental. You might have to cut a touch of the kick-drum's extreme LF to make space, and I don't think that really hurts the song, as it'll tend to make the groove skip a bit more lightly. The vocal tonality feels like it's a little too heavy on the low mids, which makes for a slightly congested tone. On the one hand that low-mid energy helps it sound more solid in the balance than in some of the mixes I've heard on this sub-forum, but it's at the expense of a touch of muddiness overall whenever the singer's active. Admittedly, the whole question of how to get this vocal sitting solidly in the mix is one of the critical issues with this multitrack, so the solution, whatever it is, is likely to involve a bit of 'smoke and mirrors' -- you know, ducking things in some way when the vocal's present, either with side-chains or automation. By comparison with the lead vocal, the backing vocals feel a touch too crispy, so I'd probably try to tame those a little -- it's a shame to have the backing vocals sounding more upfront than the lead, I reckon. Overall the drums work quite well for me. I like your toms tone in particular, and the way those drums cohere fairly effectively with the kit as a whole, which is something that's been a bit wayward overall on the mixes I've heard so far. The low tom probably has a bit too much 'woof' at the low end, though -- it just seems too 'large' to match the rest of the kit. Hope some of the above makes sense and is helpful -- and thanks for posting! Critique: Well, you're preaching to the choir on that banjo [Herb had previously posted: "The banjo is featured throughout the song in the instrumental parts. Not sure if this is everybody´s cup of tea, but I love banjos and wanted to hear it more often. "], because I think it's a great part in this song, and also works very well in the intro, so I'm certainly not going to question that arrangement call. Overall, this is another almost punk-flavoured interpretation, which is an approach I rather like, as it emphasises the inherent aggression of the lead vocal performance. I wonder whether you might have overplayed the 2kHz region, though, as there's a slightly telephony edge to the tone. This doesn't help with the backing vocals, which really hit this range hard and feel a bit piercing as a result. A touch less 150-200Hz overall as well, perhaps? It's mostly the bass that feels slightly too porky there, so maybe it could simply be a dip on that channel required. Overall I love the attitude here, and it everything holds together within that concept -- the heavily compressed drums, the electrics-heavy balance, the hairy vocal tone. The vocal treatment is particularly nice in that it really brings out his performance character -- so nice job there! However, I wonder whether you could have 'hardened' the sound a little more to compete better with such hard-edged guitars. In terms of effects, I like what you've done. There's great blend, and that delay spin in the Mid-section is nicely placed. One thing that niggles slightly is (I'm guessing) the action of your buss compression, which feels like it's unduly ducking the backing in response to the lead vocal. Check out the end of Verse 3, for instance, and how the track seems to suddenly bump up in level when the vocal finishes (around 1:48). And then you really seem to lose impact at the start of Verse 4 when the vocal ducks the backing level again. I have nothing against the healthy vocal level in the mix, but I think it might be worth controlling it a little more on the channel, rather than relying as much on the buss compression for that purpose. Admittedly, this kind of thing can be complicated to deal with in practice -- in fact, this is one of the reasons people sometimes use multi-buss mix processing, so that they can keep the main buss compressor pumping away on the backing-track without it excessively catching the lead vocal. I do like this version a lot, though -- bags of attitude, but still well controlled where it matters. Thanks for posting, Herb! Forum responses: Herb Felho post. The lead vocal still feels a bit 'soft', and doesn't feel as solid as, say, the electric guitars or banjo. This is something that can be very difficult to adjust, but I'd suggest experimenting with a bit of parallel distortion, or at least something with slightly grubbier compression. Funnily enough, the backing vocals seem to fare better in this respect, so perhaps you might be able to transplant some processing ideas from them? And in the process, maybe you might make the backing vocals a touch less hard-sounding into the bargain -- they're about the only thing that doesn't really seem to blend well at present for me. The acoustic guitars also feel like they're poking too far forward, which slightly undermines the illusion of power in the band as a whole. Other than that, though, there's only one thing to add: this is definitely a good mix, but is it the right mix? What you've produced here is great to listen to on a technical level (and, incidentally, very much after my own heart instinctively, in case you hadn't noticed! ), but it does niggle me that it feels a bit too safe and 'pop'. I'm not judging the winner of this competition myself (that's up to the artist), but I could easily imagine that this mix might end up sounding more hi-fi than the one he chooses, because musicians often prioritise attitude over craft. In that respect, I have to say I'd personally have fought my own instinctive inclination to create exactly the kind of mix you've produced here, because it's my hunch that something more risky and less controlled would serve the music (and indeed the musician) better. Clearly it's a judgement call, but I figured it might still be useful to at least air what my gut's telling me here! On its own terms, though, this was a pleasure to listen to -- thanks for sharing it with us all! Critique: The basic balancing makes a lot of sense here, and I like the emphasis on the vocal -- since that's the star turn, after all. However, there's a bit of a mismatch between the tonality of your backing track (which is rather heavy on the 100-200Hz region and generally lacking high end) and that of the lead vocal (which, while far from bright, still has considerably more energy in the upper octaves of the spectrum). While a bit of master-buss EQ can help redress the backing track's tonality, it also overbrightens the vocal, so you'll need to do some work with at least the vocal channel EQ as well to find a more convincingly balanced spectrum overall. I realise that keeping the backing track less bright makes the vocal less masked, but if this was the thinking then I think you've perhaps pursued that goal too far in this case. One side-effect of the aforementioned mismatch is that the lead vocal never really sits well with the rest of the backing track (which otherwise isn't at all badly blended), but rather floats over it. You seem to have added some kind of subtle stereo ambience to help glue it in there, but it's not doing the whole job yet, for me. That said, I reckon that if you deal with the EQ issue, it may actually end up being enough. As with many of the other mixes I've critiques, I think you've let the kick-drum dominate unduly below 100Hz. Try giving the bass a little support in this area instead, and I think the mix as a whole will seem more wide-bandwidth -- it'll also mean you don't have to rely as much on the 150Hz zone to hold the bass's place in the mix. Another thing that might also help open up the sound subjectively is if you widened the stereo picture for the main riff a bit. The drums are wide enough, admittedly, but the guitars all seem rather narrow. Although this does give you some extra contrast for the Mid-section when the wide-panned clean guitars arrive, I think there's enough opportunity for timbral/effect changes there that you don't really need to rely on the stereo change that heavily. The backing vocals have caused problems for some people, but I like what you've done with them. They're a little bit more upfront than the band, but less so than the lead vocal and not seriously endangering the apparent power of the backing track. Hope some of that makes sense and is helpful -- and thanks for posting! Critique: Nice meaty drum sound you've created here, which really helps drive the mix as a whole forward -- the groove in this mix feels particularly good to me. The drums are pretty heavily compressed, but just on the right side of overcompressed, and that gives you lots of nice attitude, especially during fills like at 1:00. The snare and toms blend pretty well too. As on some of the other mixes I've critiqued, I think you've probably over-specified the low end on the kick drum relative to the bass guitar -- I'd add a bit more low end to the bass, and then go easier on the kick's sub-100Hz region. In terms of overall tonality, I think you're maybe hitting the 100-200Hz zone a bit hard (largely on account of strong bass-guitar energy there), whereas there seems a bit of a suckout in the 300-400Hz region. Evening those up with a couple of decibels of EQ cut/boost respectively seems to me to give a clearer sound overall. The stereo's nicely managed, and the stereo call-and-response thing with the clean guitars in the Mid-sections works well. I like your electric guitar sounds in general, actually, although you may have cut a little too much of the low mids, because I think you could probably get away with making them a touch fatter, especially if you cut enough 100-200Hz from the bass to make room. The guitar balance is good, though, and I like the way they all fit with the drums and the vocals. The acoustic instruments do feel a bit spindly, however, and not very well blended in that they push in front of the electric guitars and vocals in a way that's a bit distracting for me. It's not so much a question of level balance, more that they're rather bright and spiky. If you rounded them off a touch, that might be the only thing they need to sit a lot better. With such powerful drums, I wonder whether you might be able to turn the lead vocal up a bit more too, as well as maybe giving it an extra shot of 800-900Hz to solidify its place in the mix. That'd also make more sense of the lead-vocal versus backing-vocal balance, which seems a bit back-to-front, given that the backing vocals feel stronger in the balance. Altogether, then, this is a pretty successful interpretation with plenty of attitude. Thanks for posting! Critique: This mix is very focused-sounding, but I'd say a little too heavy on the lower midrange, which makes it sound a bit tubby. Even if you cut a bit of this with master EQ, however, the lead vocal continues to make the low mids sound clouded, so I'd maybe reevaluate the EQ choices there as well. It just seems a shame that Diesel seems veiled by comparison with the slightly punky guitar sounds (which I like, and which blend nicely with the banjo in particular). In this context, majoring on the kick drum's sub-100Hz frequencies unfortunately exacerbates the slightly boxy feeling, but I reckon that wouldn't be too tricky to redress with a bit of EQ cut on the kick, making way for some enhancement of the bass guitar's fundamentals perhaps. By the same token, the comparatively narrow stereo image you've chosen for the main riff and verses also contributes to the sense of constriction. I can see the thinking here, though, as the way the wide-panned clean guitars in the Mid-sections then dramatically open out the picture is a nice bit of structural reinforcement. However, I think you could do more to suggest that the mix is still full-width elsewhere, even if you don't pan sounds obviously to the extremes: wide stereo ambiences, perhaps, or a bit of panned delay slapback -- even stereo background noise might do it! Those more 'big-picture' issues notwithstanding, in general I like the balances you've chosen in this mix. It's a bit of a rockier vision than some, but the acoustic aspects still make their presence felt, and you can hear lots of detail in there, which is a good thing when there's so much tasteful musicianship in Joe's playing. The snare ambience is very thick, and might be out of place in a more acoustic mix, but here I like the way it fits in with the compression and lends that specific drum extra stature. The toms blend pretty well too. Finally, I like the way you slot the backing vocals in, but they could probably use a touch of de-essing, as the consonants seem a little out of balance with the body of the sound. Thanks for another eminently rocky version, and I hope the comments are some help! Critique: It sounds like you've been fighting to make sense of what you're hearing [through Waves NX and headphones, as stated in a previous post], because the overall tonality of the mix is very middly, with the region from 100Hz to about 1kHz dominating over the rest for the most part. That said, there also seems to be quite a lot of energy in the top octave -- on the vocal sibilants and snare in particular -- and the 2kHz zone seems a bit recessed. No panics, though. I've had this kind of thing when recording on headphones (or when dealing with unfamiliar speakers and acoustics) on location, so I know how easy it for this to happen, and I know that it's possible to tackle. The main thing is (as you've already surmised) to give enough time to the mix-referencing process, as that'll make any spectral biases of the monitoring more obvious to you as you work. As for specific suggestions for references, this contest mix was tricky in that respect, because Diesel left the field wide open for new interpretations, rather than dictating the sound he was after, so it puts the responsibility back onto each mix engineer to decide what sound they're aiming for, at which point they need to find specific references to support that. In acknowledgement of that I personally threw my net fairly wide when selecting things for comparison while doing these critiques. For instance, I referred to a couple of dozen things out of my own personal reference collection (though most frequently to Paolo Nutini's 'New Shoes' and James Morrison's 'One Last Chance') and then worked through about 20 likely-looking tracks I'd recently come across in my work for The Mix Review column, ending up with a shortlist of James Bay's 'Hold Back The River', Chris Stapleton's 'Traveller', Alabama Shakes 'Don't Wanna Fight', and The Steeldrivers' 'Hanging Around' so that I had plenty of bases covered. Of course, if I were mixing this myself, I'd probably shortlist a little more stringently, in order to decide for myself what the most relevant tracks were to my own choice of vision for the mix. It's a bit of a pain in the neck, but what I can definitely say without reservation is that it's worth the effort! It's a bit tricky to comment about more subtle balance issues in your mix in the light of the tonality concerns, but I suspect you've got your heart in the right place, as many of the levels do nonetheless seem instinctively pretty sensible. I suspect you could, like many others, benefit from more low-end on the bass guitar, and some de-essing on the backing vocals would make sense, even with less HF fizz, as the consonants are pulling those singers too far forward for me. A bit of extra stereo width in the riff and verse sections would probably help give more of a sense of openness to the mix too, once the overall spectrum's more balanced. Hope some of that's useful! Critique: Masses of attitude here, with an unapologetically processed and compressed sound. Certainly caught my attention! On the one hand, its such a strident and confident vision that it's tricky to evaluate from a technical standpoint, but on the other hand I think there are some things I might still tweak, even while trying to put myself into your shoes, so to speak. The first question is that drum reverb, which is nothing if not a statement! There's something I like about the way it rumbles away under the riff sections, and it does provide a kind of subjective compensation for the bass-guitar's low-end lightness, somehow. It also does no harm in terms of pulling the drums back (allowing the more interesting parts to stay forward), and the kick doesn't play anything fast enough to get lost in it either. Yet somehow I can't warm to it, and I'm not quite sure why -- in fact, it may honestly say more about me and my personal preferences than about the mix! Perhaps it's to do with the mismatch between the upfront snare and the very diffuse kick? I can imagine that EQing the kick for a bit more bite to compete with the snare might make it sit better for me, so maybe that might be worth experimenting with. Or else, just ignore me... Along similar lines, I'd maybe suggest bringing the toms more upfront than they currently are, again to be more in keeping with the snare. I like the lead vocal, although I might have added a scrap more 800Hz and dipped a bit of 200Hz to harden the tone a touch. It feels a bit recessed compared with the snare and electric guitars. The reverb is maybe a bit hissy too on the sibilants. I've no problem with an obvious reverb like this, but a bit of de-essing in the reverb send would perhaps help reduce this artefact. I like the backing vocals a lot: where other mixes I've critiqued are quite well-defined in this department, these grumble along less distinctly as more of a textural device, but are no less effective for that, I reckon. Finally, is that momentary chord change at 1:57 intentional? If so, then I'm not quite sure where I stand on it. Yes, it does drag my attention back to the track at that late stage (the fourth verse repetition) which is a good thing, but it also seems to interrupt the groove too, which I'm less keen on. On balance I'd probably ditch that myself. Thanks for another horizon-expanding version -- I think I probably learn more from these critiques than anyone else does, in fact! Critique: An extremely full-sounding mix this, but nicely balanced in general, and with a great sense of blend too, despite no obvious surfeit of reverb. Love the effects spins on the vocal in Verses 2/4 and the Mid-section -- it's this kind of active differentiation of the sections that's part of what helps really draw me into the song in your version. Incidentally, both those effect spins would have been overkill if you'd used them all the way through, but when they only operate as spot effects they work really well, and this actually illustrates a wider truth about mixing, I think. One of the secrets to an engaging mix is doing things in the short-term that would be unacceptable if carried through the whole mix -- whether that's an odd balance, an odd effect, an odd arrangement, or whatever. It's those things that really catch the ear, so I'm delighted that you've made good use of this principle. That said, I can't really see the rationale behind muting the cleaner guitar parts in the Mid-sections, as those provide some great musical variety, and anything riff-based like this needs all the arrangement variation it can get. (Perhaps just leave them for Mid-section 2 -- I can see that working well, especially given how full you've managed to make the band texture even with just the rhythm chugs there.) By the same token, you've taken a bit of a gamble by giving the acoustic parts so little exposure. It's not that your vision doesn't work, because it does on its own terms -- in fact, it blends better than many other mixes I've heard that feature the acoustic elements more strongly. The gamble is that you're chucking out a lot of things the artist connected with while tracking, and there's always the possibility that you've over-highlighted the parts he liked less! That's not meant to be a criticism, though, because I like bold mixes, and some of the most well-received mixes I've ever done have been where I've focused the production into a clearer and more direct form like this. And it's probably also worth saying that in any competition situation (whether for a contest like this or when competing for business) it's more often the daring mixes that win out in my experience, so the chances of success may arguably be better if you deliver a unique vision that stands or falls according to whether it appeals in its own right, rather than if you play things safe and have to compete on finer details against a larger number of more conservative mixes that sound similar. I like the heavy compression you've used on the vocal and the mix in general -- it's not going to win any awards from Bob Katz, but it feels absolutely appropriate to me. One technical issue with the vocal compression, though, is that I think the breaths and the starts of some of the words are getting overemphasised, so I'd probably do a bit more vocal level automation to compensate for that. I also like the way you seen to have enhanced the midrange of the vocal tone, which is something that I think it really benefits from in terms of sounding solid in the mix. As a result, you don't have any troubles with the guitars or drums sounding like they're in front of the vocals -- although clearly the healthy vocal level is also responsible. Bear in mind, though, that there are plenty of effects on the vocal too, which could also have pulled it way back in the perspective, so I think the midrange issue still counts. Speaking of which, this mix also puts the lead clearly ahead of the backing vocals, which seems quite appropriate again. The overall mix tonality seems too full in the 100-200Hz region, as has frequently happened in the mixes I've critiqued. Clearly, you want a good strong bass presence in this mix, but I'd suggest cutting some of that zone out and pushing the sub-100Hz region instead. As it is it feels like you've over-pushed the low end of the kick drum to fill out the overall mix spectrum, given the lightweight fundamentals of that particular bass recording. Thanks for posting another great vision -- we're spoilt for choice! Critique: I like a lot of your balance decisions in general here. It's a gutsy vision you've gone for, which is no bad thing with a song that has such a combative attitude as this one. I like that you've kept the vocal solidly upfront, as befits his importance to the track, and that the backing vocals are a good step behind him when they arrive. The blend between the drums and the electric guitars is good too, and gives a respectable 'band playing together' illusion. 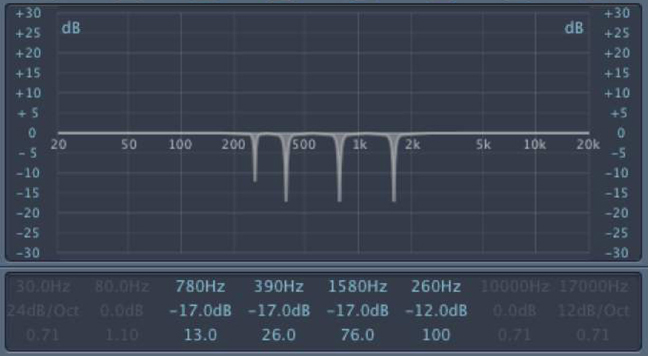 As with a lot of the mixes in this subforum, I think the kick-drum's sub-100Hz contribution is stronger than it need be, and that the guitar texture would feel more powerful and full-range if you enhanced the bass guitar's fundamental frequencies in that spectral zone instead. I suspect you may possibly not be able to hear well enough what's going on sub-50Hz in your room, because the kick's putting out a lot of energy down there, and more than I'd really advise -- you may find it does funny things to your mix in some end-user playback situations. Certainly, the subjective impression of kick-drum level in your mix via full-range monitors is very different to the impression via smaller speakers, which is rarely a good idea as far as mainstream mix-translation is concerned. Other than that, though, the overall mix tonality seemed fairly well balanced -- maybe a fraction over-scooped in the 300Hz region? Although this is definitely an electrics-biased guitar balance, the acoustic elements actually blend better than I've heard on a lot of the other mixes I've critiqued, primarily because the transients and high-end don't seem overemphasised. (I actually wonder whether some people are adding high end to these acoustic guitar parts almost as a reflex, but that's only surmise on my part.) That fast tremolo effect on the ElecGtr03 part in the Mid-sections is very cool -- I like that a lot, as it's almost a little hook in its own right. Not sure about the vocal effects there, though. While I'm totally in agreement that a change in vocal effects can usefully help differentiate that section, and I can also hear the retro kind of idea you have in mind, in practice I think the effect's got too much low midrange, so it gives a rather muddy-sounding frequency build-up that doesn't seem to fit with the clarity of most of the rest of the mix. That said, I love what it does with the "hah" at 2:09, because this gives a great sense of him shouting 'off mic', so to speak, and adds to the sense of live performance for me. Overall I like your use of more 'techical' mix effects too, and this is clearly part of the well-blended character of what you've done. A couple of small queries with respect to the front-back perspective, though. Firstly, could the ElecGtr04 part have something to glue it in a bit better during Outro 1? It certainly makes a statement by being so dry, but somehow it also seems to undermine the acoustic illusion you've been developing up to that point. And, secondly, are the cymbals a touch too bright? They feel like they're maybe a bit too far forward at points. Besides, if you clear a little of the high end out of the cymbals, you'll be able to get a bit more detail into the electric guitars, for example. Thanks for uploading your version, and I hope some of the above is useful! 1st Prize: Dangerous: "Exciting as hell to listen to! An original and well-constructed new take on the intro and a great crackling, barrage of guitars. We love the snare sound -- lots of under-snare in the mix (which isn't the usual choice), bringing it sonically into line with the guitars. A few resonant frequencies start to get wearing and the bass is a little light, but the sheer energy and use of original ideas lift this mix above such petty considerations! Brilliant work Dangerous!" 2nd Prize: Olli H: "An energetic and original mix with tonnes of energy and attitude. Imperfect in many ways, but great choice of sounds, particularly the guitars, backing vocals, and bass." Runner-up: thedon: "The best mix in terms of balance and cohesion, but a little on the safe side. Great mix though!" Herb Felho: "Original and chaotic, with great energy." Marty: "Brave, exciting, and head-nodding." "On the whole the entries seemed to underplay the vocal in terms of volume and power." "The low end was wildly inconsistent across the different submissions -- non-existent in some and overpowering in others -- so we suspect that many entrants may have suffered from working on small speakers and headphones." "There were resonant frequencies in almost all the mixes that needed taming and made the overall mix sound tiring -- at least to those familiar with the recording of the song! Here's a screengrab of a suggested setting for the main acoustic guitar, for instance:"
For a roundup of the most common issues highlighted by this competition, illustrated with audio demonstrations from the various submitted mixes, check out the December 2016 Patrons Podcast. Also featured are my own personal highlights from the critiqued mixes. Download The Winner's DAW Project! Following the Podcast, Dangerous very kindly agreed to provide his full DAW mix project so that everyone could scrutinise his winning formula! So here's a 574MB ZIP download containing that Cockos Reaper project, complete with all the project's audio files. Please be very careful when playing back this project for the first time, because if your installed plug-ins vary from those Dangerous used then you may get unexpectedly high output levels from some tracks! The ZIP archive's 'ThirdPartyPluginScreens' folder contains bitmap images of the settings for all the third-party plug-ins used, so you can see all their settings even if you don't have all the same plug-ins installed. The image files are named according to track number and plug-in slot number, so it should be pretty quick to find what you're looking for. Where there's more than one important page of settings in the plug-in GUI, there are several images of the same plug-in with suffix letters to differentiate them. 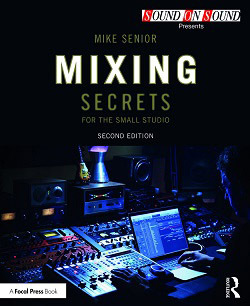 Book: Mixing Secrets For The Small Studio: A complete mixing primer, based around techniques from more than 100 of the world's greatest producers. Ever wondered how Mike can achieve such dramatic Mix Rescue transformations using ordinary mass-market gear? This book shows you how, step by step. Book: Recording Secrets For The Small Studio: A complete recording primer, based around techniques from more than 200 of the world's greatest producers. Full of power-user tips specially adapted for small rooms and limited budgets. If you've been listening to Mike's Session Notes recordings, then you can read in depth about his recording methods here.